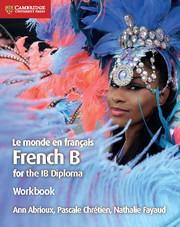 The workbook provides students with extra practice as they explore the five themes from the new IB Diploma Language B guide: identities, experiences, human ingenuity, social organisation and sharing the planet. It helps students further develop their French language skills with additional exercises complementing the activities in the coursebook. With activities suitable for both standard and higher level students, the workbook is ideal for teachers needing differentiated exercises for their class and can be used for independent study. Answers to the workbook questions are in the teacher’s resource. The workbook matches the units in the coursebook, so teachers can use the two together for specific skills building. Includes extra grammar and vocabulary practice related to the theme of the coursebook unit. Includes activities suitable for all abilities so teachers can use it for differentiation.